It is hard to beat such a well planned trip, with such a great guide/leader, to such beautiful national parks! I gave this score based on the location on the hotels and sometimes too basic camping facilities. But the program AND the leader focuses mainly on showing us nature and that's exactly why i came to make that trip. What you also learn by the leader and on tour is something you cannot learn elsewhere. I chose this trip because it went to the places I couldn't get to myself. In this sense it was fantastic. However it could be organised/run better for leaving and arrival times. My trip was let down by the constant reminder of tipping the tour leader. It was one of the first points in our introductory meeting. I would have liked 1 more day in Yosemite so that I could see more as its such a huge place. Welcome to the USA! Your adventure begins with a welcome meeting in the hotel lobby today at 6 pm. If you can't arrange a flight that will arrive in time, you may wish to arrive a day early so you're able to attend. We'll be happy to book additional accommodation for you (subject to availability). If you're going to be late, please inform the hotel reception. We'll be collecting your insurance details and next of kin information at this meeting, so please ensure you have all these details to provide to your leader. Las Vegas may be the gambling capital of the world, but there's plenty to do if gambling isn't your thing. We recommend you arrive a few days early to make the most of this exciting city. Hit the shops, feel your stomach drop on a rooftop roller coaster or simply stroll along the Strip, soaking up the glitz and gaudiness. In the evening, perhaps feast on an 'all you can eat' buffet, check out one of the many shows on offer or party the night away in a Vegas nightclub. 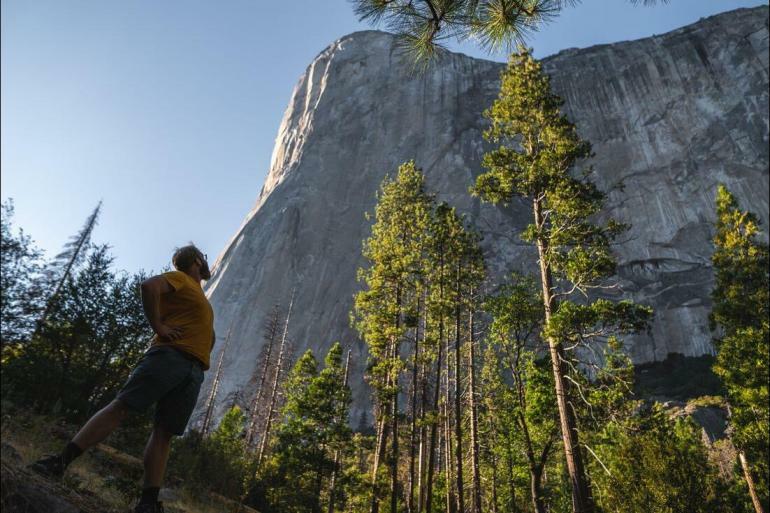 Leave Yosemite behind today and drive west for about four hours to San Francisco. The 'City by the Bay' has a beautiful setting and a vibrant, multicultural heart. You might like to check out the vintage stores along funky Haight Street, catch the tram down to the waterfront or take an adventures cat cruise on the bay. The trip finishes on arrival into San Francisco after a stop to check out the Golden Gate Bridge. No accommodation is provided tonight. The arrival time depends on each group, but if you decide to fly out on this day, please don't book a flight before 9pm. This will give you enough time to catch a shuttle from the hotel to the airport and be there two hours before departure. If you are staying in town for the evening, perhaps head out for some dumplings in Chinatown or pasta in North Beach. If you do wish to spend extra time in San Francisco we'll be happy to book additional accommodation for you (subject to availability). Guides Your Intrepid group leader’s role involves organising the overall operation and smooth-running of the trip, managing trip logistics and camp responsibilities. They will work to make the trip as safe and enjoyable as possible for all travellers. Intrepid's North American trips are built around the co-operation and participation of all the group members under the supervision of the group leader. On our camping trips, your leader will show the group how to set up and use the camp equipment, and form work groups to take turns cooking, cleaning and shopping. Everyone is expected participate and carry their share of the workload, making camp chores easier. If the whole group participates it will be quicker, easier and more fun. Your leader will provide basic information about the sights and cities you'll be visiting but please note that our leaders are not 'tour guides' in the traditional sense. They are adventure travel specialists and are there to organise your trip, arrange activities and help with questions or problems you may have while on your tour. Your leader will provide you with all the important information you need to embark on your own explorations. They are also responsible for driving the van and navigating across the country. The allowable driving times for drivers is strictly controlled in North America. This ensures our drivers are well rested and are not over-tired from too many hours on the roads. While your group will have a minivan for all included activities on the trip, please note that the services of the van and the driver may not be available for your use during free time, or after you have arrived for the day. If you need a special trip into town you may need to arrange transport or a taxi. We endeavour to provide the services of an experienced leader however, situations may arise where your leader is new to a particular region or training other group leaders. It's strictly forbidden for non-qualified rangers to present any information about some National Parks in North America, therefore we adopt a system (as requested by the park rangers) where our leader will encourage travellers to visit the information centres in the National Parks for details about the site. We have designed our trips to make the most of your time in the States, but please understand that there are certain times during each day that your leader will need to be off duty from work. This includes having meal and rest periods and personal time. Your leader will provide you with all the important information you need to embark on your own explorations.